Is It Ever Okay To Bring Your Concealed Carry Gun To New York City? In a growing trend of what can only be explained like this: “The Second Amendment is my concealed carry permit and I'll bring my gun anywhere I choose,” gun owners decidedly bring their concealed carry guns to NYC, get busted, and do jail time for illegal possession of a firearm. This time around, a man from Georgia, who is legally allowed to have his gun in that state, brought his Glock with him to go sight seeing and got jammed up for it. The funny, or stupid, thing is that he didn't even have his gun on him when he got busted. Instead, a room service attendant from the hotel he was staying at found his Glock under the mattress in his room at about 11 a.m., and reported it to the cops. Something similar happened just a month prior when a man from North Carolina brought his firearm up with him, and the hotel staff called the police to report it when they found his pistol under the mattress in his Brooklyn hotel, as well. First, let me please say that if your hotel has a safe, and you're not bringing your gun around with you on your person, stick it in the safe before you leave, and not under the mattress where someone may find it. Second, to answer the posed question in the title of this article, I only travel to places where guns aren't forbidden. NYC forbids guns, so I never travel there. Maybe you should take the same approach. Such idiocy underscores the need to implement a 50-state reciprocity law where someone from a freer state like Georgia or North Carolina can travel to a place like NYC with their firearm and not have to worry about going to jail for it. It is absolutely mind-boggling how someone can do jail time for something that is totally legal in their home state, but illegal where they're visiting. That above list of shoddy gun-states is an approximation of areas where you may want to leave your gun at home, but shouldn't be taken as gospel. 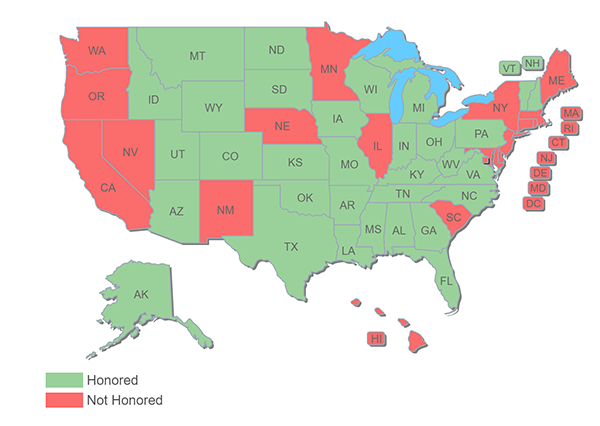 To be totally sure you should check our reciprocity map to know where you may/may not take your gun with absolute certainty. Available as a download on your phone or viewable on our webpage, it's free to use and is a great tool. At the end of the day, what it all boils down to is the simple fact that we are hopefully working towards a 50-state reciprocity law that will enable those of us who can legally carry a gun where we are from, to any state we visit without hesitation or fear of being arrested for breaking a local law. Until that time, we are subject to individual state laws, and it's up to each individual concealed gun carrier to check the laws in each state we go to. Let us know what you think about those guys getting busted in NYC for having their guns in the hotel. Also, what did you think about where they “hid” them? 20 Responses to Is It Ever Okay To Bring Your Concealed Carry Gun To New York City? If I have to leave my firearm in my hotel room and there is no safe, I keep it locked in a gun vault. I secure it, as well as possible, to a heavy piece of furniture. I always put a do-not-disturb sign on the door and leave the television playing. But, like you, I go out of my way not to travel to anti-2nd Amendment states once I leave my home state of California. I would not take a firearm to either New Jersey or New York city. We have family in NJ. You may be able to get permission upsate NY, but check first. That would be for hunting with long guns or shotguns. Concealed, probably not unless you are an active or retired LEO. I am neither, so don’t even press the issue. I travel from Colorado to Michigan frequently. I have a CCW permit in Colorado, honored in every state I travel through except Illinois. I stop in Davenport for gas, lock my unloaded firearm in a lock box and drive without stopping to Hammond Indiana, where I open the box and reload. I lawfully transit Illinois under federal rules. And not one damned penny goes to the state of Illinois. Where only criminals can have guns… What is up with that? 30 years ago I lived in NC. I drove a rig for a furniture company and always carried a 25 auto in my pocket since we carried cash from furniture sales. At the time I was in NJ about 3 blocks from NYC. I parked the truck at a motel and walked across the street to a restaurant. Without being aware I had j-walked and a cop was standing there. He decided that he want to check me out and discovered the pistol. I was arrested, bonded out for $200 and 30 days later went back to go to court. I was fined $150 and they kept my 25. A couple of years ago I decided I wanted to get a CCP. Wrong! The report came back that I was a FELON! Yep, 30 years ago and a $150 fine got me a felony on my record for “possession of a firearm”. $1000.00 later and a years time I had the charge expunged from my record. Take it from me, if the state does not allow firearms, don’t carry!! we laws are laws and remember the Federal Law says one thing and a state or other as well as it’ city and counties / Towns. Under the US Constitution it states one thing and the Federal Law has to remain that way until they get an amendment passed changing that by ratification as it’s part of the Constitution. Every sate has it’s laws and when it comes to the US Constitution or Federal Law that have to abide by it and can not take away from the law but can add to that law with it’s own state law. If you want to carry any place in the US you would likely have to fall under the HR 218 law passed a few years ago for retired LEO’s and such but that has restrictions as well. So in short, if you think you will buck the law be advised you might find yourself busted and the owner of your own need for a defense fund! Be smart…check the law before you try to circumvent it. I do know for sure that the list given above holds true to it’s laws and as far as a means of gun controll I don’t like it but support the right of a state to enforce it’s laws and always will until the law is changed! My father lives in upstate NY and has a NY State concealed carry permit. Even those who have a permit in NY are restricted from carrying in the city. On his permit it clearly states “not valid in New York City unless approved by the Police Commissioner of NYC. ONE THING I CAN GUARANTEE YOU…THE CRIMINALS IN NYC DON’T GIVE A F**K ABOUT THE GUN LAWS. The law makes law abiding citizens nice, easy targets for criminals. I agree with Joshua, better to stay away from that place altogether!! If you can use your drivers license to drive in any state you should be able to use your CCW license in any state ! OR better yet no permit needed in any state if your a law abiding citizen. I am curious why Delaware is in the list of off limits states. I have permits that are recognized there. If you could advise me because that is a place I frequently vacation and I carry while there. Joe, if you have a permit that is honored there then all is well… but you are a lucky man as Delaware recognizes very few permits from out of state and they make it very hard for locals to obtain one. Jacob, this article is essentially accurate, but you seem to be a bit misinformed regarding a few states that honor other states’ permits. Delaware for example currently honors 20 other state permits and doesn’t require residency in those states; http://attorneygeneral.delaware.gov/criminal/concealed-carry-deadly-weapons-ccdw/ . For example, my nonresident Utah permit allows me to carry in Delaware. PA is more restrictive than Delaware. Connecticut issues many out of state permits. Although it’s technically a shall issue state, I’ve never heard of anyone who qualifies being turned down. South Carolina honors only 23 states’ permits AND the permit holder must be a resident of the honored state. Thanks Russ. If I said something specifically incorrect please point that out for me! Also thank you for your input on the Connecticut issuing process as that is news to me! Hey Russ, Thanks for the comment. I live in PA and my LCTF is honored in over 30 states. If DE honors 20 I’m missing how PA is more restrictive. Also, while SC only offers limited reciprocity they won’t, to my limited knowledge, jam you up for having a gun in your car. So, while you can’t carry your gun in SC, having it with you or locking it in a safe won’t send you to jail, where it could in several of those other states. Blev, you make a good point. But there is a difference. M.J. is not covered under a constitutional clause or amendment. Gun rights are. While I do not use, and never have used, recreational drugs, I’m all for decriminalization them. But that is a very separate issue. We all need to PRESSURE our Congressmen to pass a nation wide reciprocity law, and not let up on the pressure until it is done. If possible, I stay clear of the anti-gun states. However, I keep a gun safe (airline rated) locked in my vehicle to lock away my unloaded firearm when entering an unfriendly state. I wouldn’t go the NYC for any reason! I recently made several trips that would normally require me to drive though Illinois. Instead, I took the long way around to bypass that state rather than have to lock my gun in the trunk. Don’t bring your gun to New York? As a student of history and constitutional law I am reminded of Dred Scott. Don’t bring your slave to a free state, Illinois. Don’t bring your gun to a slave state, New York. Both of these problems were solved by constitutional amendments. The problem is only one is being enforced. Never forget Supreme Court Judge Taney wrote if we declare Dred Scott to be a citizen he will be able to own and carry firearms. I know that NYC is considered a whole different world unto themselves. But what other states are considered “unfriendly” to qualified retired police officers under LEOSA? I live in CT with a CT permit to carry. I refuse to go to NYC. I won’t set foot there or spend a dime in NY. NJ is another state I avoid. I lock my gun in my trunk when I pass thru MA to go to ME, NH or VT.